This would be the forum for questions about how to work with mod making tools which can be a problem of its own. Across the history of Phrozen Keep there were many people who announced making .cof editor, but these projects were never finished. The only available tool is DOS-based cof editor which doesn't have interface and very limited functions. Today I'm presenting you The Ultimate COF Editor, "Coffee". COF editing has never been easier, now it's really like having a cup of coffee It was written by a programmer by the name "Hz" by my request it's written in C++ (v.1.0 was based on Delphi). 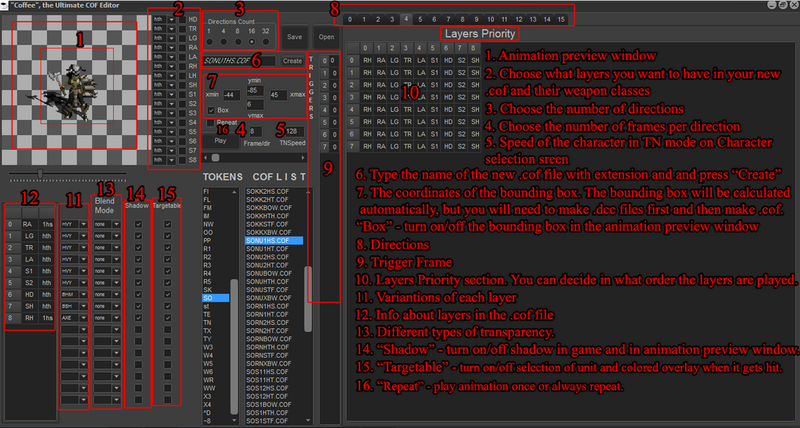 It can do everything you ever wanted to do with .cof files in real time, and also this tool can edit the Layer Priorities, which hasn't been possible before. On the screenshot you can see the explanation of the interface. Holding Left mouse button on the Animation preview window and move left/right – quickly rotate the directions. Holding Middle mouse button on the Animation preview window and move left/right – increase/decrease the speed of animation. Holding Right mouse button on the Animation preview window – move the image. Double click on the Animation preview window – restore center position. Middle Click on the layer name in The Layer Priorities section – fill the column with this layer. The program was rewritten in C++. Fixed bugs related to launching and running. Now you don't need any other files, just the .exe. 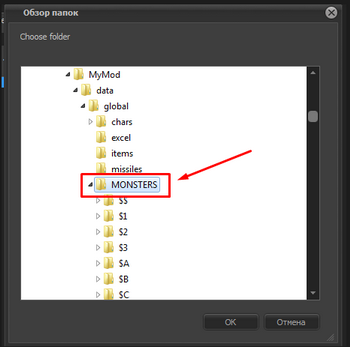 To open .cof files you need to set the directory to the folder which contains the tokens, for example data\global\monsters. When you press "Save" the program will create a backup file in the "Backup" folder. Here is the demonstration of my test character animation, where I edited the layer priorities, to make the layers play correctly. Please write your comments and bugs feedback in this thread. Necrolis, Lectem, Kingpin, Ogodei for help with some of the unknown bytes. Paul Siramy, for his dcc decoder. All members of Phrozen Keep community! Last edited by jetaman on Tue Jan 15, 2019 3:11 pm, edited 11 times in total. This tools is helpful to me. I downloaded this tool in the hopes that it might fix a problem I'm having. Launching the program brings up the GUI, but I can't figure out how to actually open anything. Clicking on the open button allows me to browse to a folder, but selecting a folder that has .cof files in it doesn't change the display to show anything related to that .cof file. Is there some kind of setup I need to do in order to view files properly, or am I missing something obvious? Edit: Browsing to the data/global/monsters folder allowed me to choose which token I wanted to view, and then it works just fine from there. I was choosing the token folders to start off with, and that didn't work. Thank you for this great tool! I can't open anything with this version. Right click on a .cof file and choose "open with" and choose coffee.exe. it should work. I can edit this now,but why can't save? I clicked greating and save,nothing be change. The files are saved in output folder. I changed the TNSpeed ,the cof was save,but when i open the cof again,nothing change. TNspeed is the speed of your char animation in the Character selection screen, not in game. Hey, we are working to fix this problem. meanwhile, I uploaded the latest version. You can try and see if it helps. Use drag and drop in icon Coffe. panel tool bar "cof file" \DI\Cof\DIA1HTH.COF - Total Commander. I need make a 4 layers cof like diablo.How to do this from coffe? We tried to fix it. Please download it again and check if it's working. Hey! Thanks for this program. But, unfortunately it is displaying that the link is no longer there. Coffee has been updated to v.2.0. The tool is now rewritten in C++. All bugs should be gone. Sorry that I had to take it down for a couple days. I have a question. Is it possible to give monster an animation that another monster has using this program? For example, In token 0F, there is a COF for SC. But, I would like the token 0E to have same exact animation. How do I got about that? Hello. You should clarify what you want to do - 0F is a Madawc, 0E is a Korlic. You can make Korlic to have SC animation mode, but only by copying A1 or A1 mode. You can't make Korlic raise his hands and cast. The animation in D2 are prerendered sprites.